The MSI installer for Print2RDP Client designed for large scale deployment in Active Directory environments. 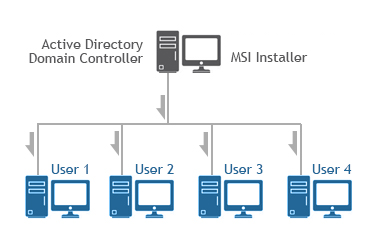 With the Print2RDP Client MSI installer System Administrators can create custom configurations for every User on the system. The MSI installer will greatly simplify mess deployment and eliminates the need for customers to build custom installations. msiexec /i "[PATH]\Print2RDP Client.msi" /q TARGETDIR="C:\Black Ice\Print2RDP Client"